Ruben L.F. Habito (born c. 1947) is a Filipino former Jesuit priest turned master practicing in the Sanbo Kyodan lineage of Zen. In his early youth he was sent to Japan on missionary work where he began Zen practice under Yamada Koun-roshi, a Zen master who taught many Christians students, which was unusual for the time. In 1988, Ruben received Dharma transmission from Yamada Koun. 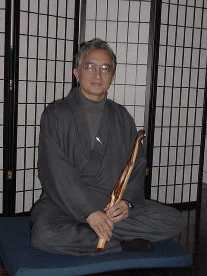 Ruben left the Jesuit order in 1989, and in 1991 founded the lay organization Maria Kannon Zen Center in Dallas, Texas. He has taught at Perkins School of Theology, Southern Methodist University since 1989 where he continues to be a faculty member. He is married and has two sons. Habito, Ruben L. F. (2006). Total Liberation: Zen Spirituality and the Social Dimension. Wipf & Stock Publishers. ISBN 1-5975-2899-4. Habito, Ruben L. F. (2006). Healing Breath: Zen for Christians and Buddhists in a Wounded World. Wisdom Publications. ISBN 0-8617-1508-X. Habito, Ruben L. F. (1995). Living Zen, Loving God. Wisdom Publications. ISBN 0-8617-1383-4. Habito, Ruben L. F. (2005). Experiencing Buddhism: Ways Of Wisdom And Compassion. Orbis Books. ISBN 1-5707-5584-1. Habito, Ruben L. F.; Keishin Inaba (2006). The Practice of Altruism: Caring and Religion in Global Perspective. Cambridge Scholars Publishing. ISBN 1-9043-0395-1. Description: Buddhists and Christians around the world have entered into dialogue, and as this dialogue has deepened some of them have taken it within themselves. They have not only studied the beliefs of their dialogue partners, but have gone on voyages of discovery that embrace both Buddhist and Christian spiritual practices. In this series of profiles we are going to meet some of these inner explorers, hear their stories, and try to catch a glimpse of how they are bringing these spiritual practices into harmony within themselves. Ruben Habito, a native of the Philippines, was one of the first Catholics to have kensho confirmed by a Japanese master, and he went on to complete koan training under Koun Yamada. He holds a doctorate in Buddhist philosophy from Tokyo University, teaches at Southern Methodist University, and directs the Maria Kannon Zen Center in Dallas. Here he discusses his own Zen training and some of the questions at the heart of the Zen-Christian dialogue. Description: Ruben Habito, author of "Healing Breath: Zen for Christians and Buddhists in a Wounded World", discusses the ways in which spiritual practice can lead to healing. This article includes content from Ruben Habito on Wikipedia (view authors). License under CC BY-SA 3.0.